There is no need for a new hospital in Northern Oakland County. 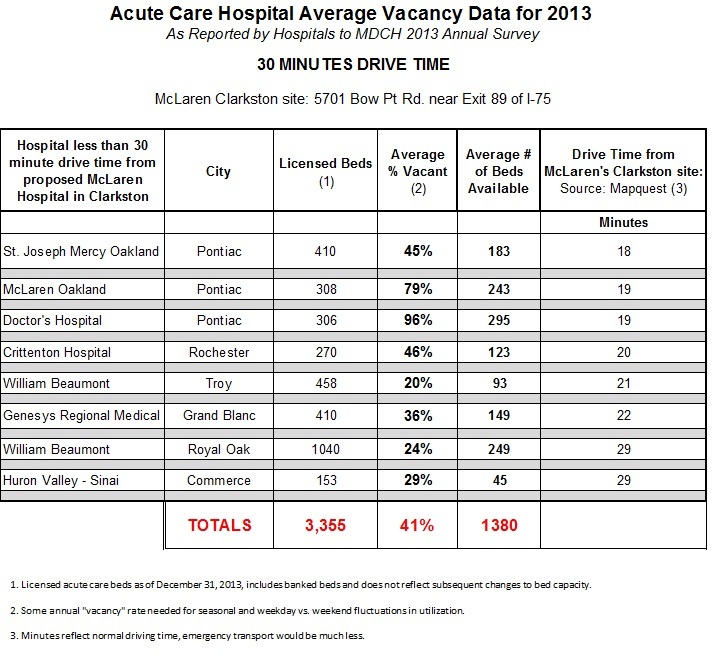 Within a thirty minute drive of the proposed McLaren hospital in Clarkston, there are eight hospitals with a total average hospital bed vacancy of 41%. Even though McLaren is proposing the transferring of beds, a new hospital will create further strain on the current hospitals to meet financial requirements. How can they all run at a capacity to make a budget? The shift of jobs and patients will cause a financial strain. Where will the money come from to support the downfall in revenue? More than likely in the form of higher health care costs to the patient and third-party payer.